RubicsCube is a simulation of the popular Rubik’s Cube. The program offers the user the ability to freely rotate the cube with the mouse, to solve it or to build different patterns. It is also possible to control the sides of the cube with a kind of command line. 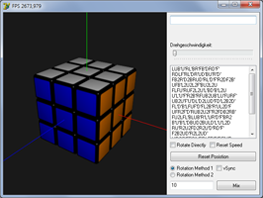 In addition, the program has pre-command lines, with which the user can generate specific patterns on the cube. The graphical representation was created with OpenGL and works with multi-sampling, anti-aliasing and a per-pixel-light shader. Rotation and motion: You can rotate the cube, by holding the right mouse button and move the mouse over the drawing plane of the cube. Here are two methods available that can be adjusted by the two radio buttons at the bottom of the control bar. Method 1 is fixed to the cube and rotates it around the vertical axis. In the 2nd method the cude is free and rotates relativ to ist position and the mouse motion. To rotate a layer of the cube with the mouse, you must select a field on the cube. A selected field is known by the slightly darker color. If the field is selected you must press the left mouse button and hold it. Now drag the mouse to a neighboring field to rotate the layer. With the slider “Drehgeschwindigkeit” in the control bar, the speed can be adjusted with wich the planes of the cube are turned. 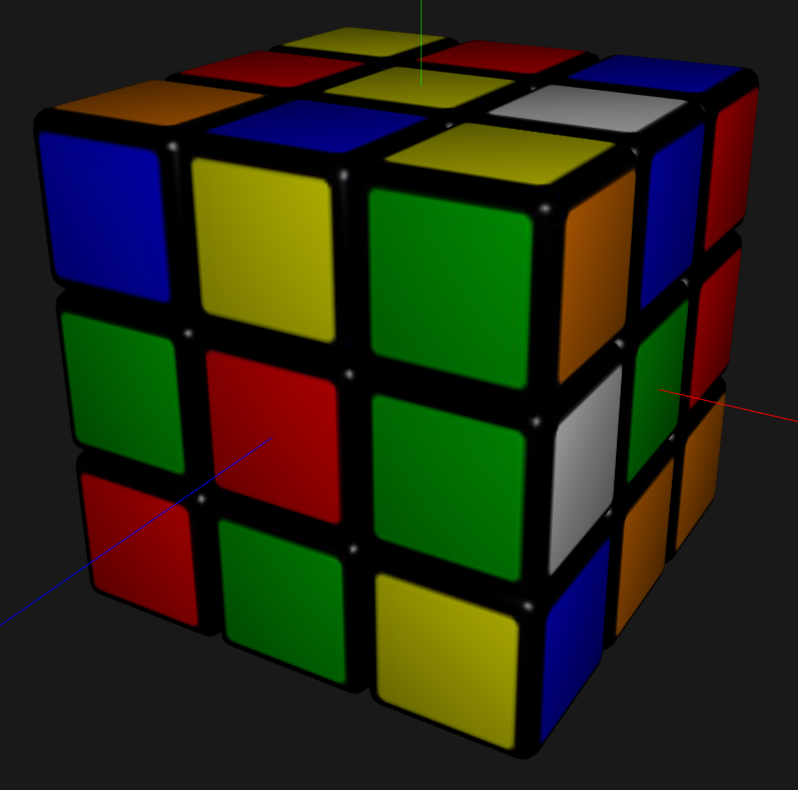 When the knob is positioned on the left (speed 0), then no rotation is performed and the layer of the cube is immediately rotated. By double-clicking an entry in the list of control panel you can load a command prompt and then run it with Start. If the checkbox “Rotate Directly” is activated, the pattern will be loaded, the cube will be reseted and the command line will be processed immediately. By clicking the “mix” button, the cube can be mixed. With the input field before, you can adjust the number of moves with which the cube is mixed. By clicking on the button “reset” or “reset position”, you can load the presettings for the cube and the camera position.